If you’re looking to develop an impressive, muscular physique, well-developed shoulders are an absolute must. Thick, round “cannon ball delts” will make your upper body appear wide and powerful and will help immensely in creating the v-tapered look that all bodybuilders strive for. Many serious lifters will argue that underneath clothes, muscular shoulders make the greatest contribution toward the overall appearance of the upper body. The shoulder is a 3-headed muscle that performs the function of lifting and rotating the arm. It consists of the anterior region (the front), the medial region (the middle) and the posterior region (the rear). These heads can be stimulated in the gym using two different movements: an overhead press and a raise. 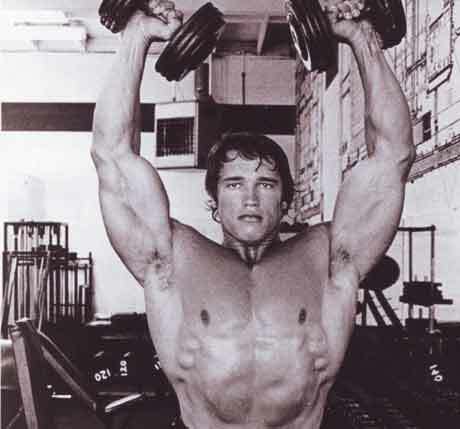 The overhead press is the meat and potatoes of effective shoulder training. There isn’t a single lift out there that can match the incredible shoulder-stimulating effect of a basic overhead pressing movement. Both a barbell and a dumbbell can be used for this exercise, but dumbbells are the best overall choice. Dumbbells allow you to move through a more natural range of motion and also don’t allow one arm to cheat for the other. They also place a greater amount of total stress on the shoulder region in comparison to the barbell, which shifts some of the stress to the upper chest. I would recommend using the seated overhead dumbbell press as your core shoulder movement. Grab a pair of dumbbells and sit on a bench with a vertical back support. Press the dumbbells overhead until your elbows are just short of locking out, and then lower them back to shoulder level. The next exercise to look into is a basic side lateral raise, which can also be performed with a pair of dumbbells. Side laterals are an isolation exercise and will shift the majority of the stress to the medial head of the shoulder. This will build greater shoulder width and will contribute to that wide upper body look. Stand with your knees slightly bent and hold a pair of dumbbells with your palms facing inward. With a slight bend in your arms, raise the dumbbells up to shoulder level and then lower them back to the starting position. When it comes to training your shoulders for maximum size and strength, a basic overhead press and a side lateral raise is all you need. It’s very important to realize that the shoulders are stimulated on virtually every single upper body exercise that you perform and therefore they do not require a lot of direct work. Most people perform far too much work on their shoulders and actually hinder their gains as a result. Because of this I typically do not recommend that you perform isolation exercises for the anterior and posterior heads. The anterior heads are heavily stressed during all chest pressing movements while the posterior heads are hit equally hard on all rowing movements for the back. A couple of extra sets won’t hurt, but you should try to minimize the volume as much as you can. The key to massive shoulders is quality, not quantity. All sets should be taken to complete muscular failure where no additional reps can be completed using proper form. Keep a detailed record of each workout and strive for continual improvement from week to week by either increasing the resistance or the number of reps performed. I have always felt this way about shoulders, a couple of exercises and done. Hey guys. Both of your sites have inspired me to lose the weight (again) and start lifting (again).